A short article by Adam Weaver about the Fight for Fifteen fast-food 'strikes' in the United States. 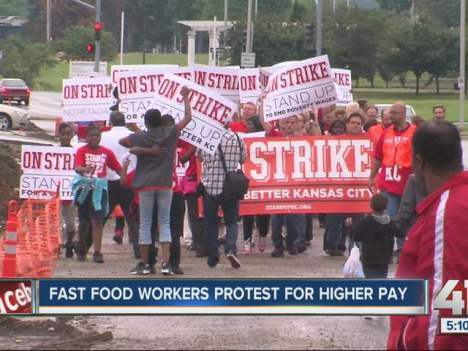 August 29, 2013 – A called for nation-wide strike of fast food workers by the Fight for Fifteen campaign (FFF) is set to go down today. Surely a historic moment, this is the first large scale and national strike involving fast food workers who are at the core of the low-wage service industry. Beginning with a series of strikes among fast food workers in New York City late last year, the campaign and the called for strike is organized by the SEIU (Service Employees International Union), though in many cities this is being organized in conjunction with allied institutional non-profit organizations. This is significant in that this is helping to popularize the use of strikes as a tactic, even for workers who are not formally part of a union, and the idea of the tactic and the experience gained can be built upon. But at the same time an on the ground analysis is needed by folks on that left that doesn’t mistake this for what this is not—SEIU isn’t building a movement to organize workers and fight bosses. Instead of a ‘march on the boss’ directed towards the corporations robbing workers daily, rather this is a ‘march on the media’ where the strikes serve as the visuals in a narrative of worker protest crafted by professional media consultants. Actions are scripted and run by the staff (themselves young, overworked, underpaid and working to meet difficult mobilization quotas) and the ultimate shots are called by officials in Washington, DC, not spontaneously by workers from below like the picture painted would lead you to believe. As to where the campaign is headed the rumors leaked so far are that SEIU is still up in the air about which direction to take this effort. One possible route is a focus on major chains aimed towards a neutrality or industry standards agreement and would likely include SEIU agreeing to lobby for some sort of pro-restaurant industry tax breaks similar to what SEIU did in the California nursing home industry in promising to lobby the heavily Democratic state government for pro-industry legislation in exchange for industry wide union recognition which included agreements barring workers from striking or speaking out on their working conditions. I think this route is unlikely and not very realistic. The second and I believe more likely route would be a move towards a range of legislative efforts including state ballot initiatives allowing cities and counties to set their own minimum wage. A third potential direction might be a combination of both employer agreements and legislation such as previous efforts of unions such as HERE to raise wages through legislation but which exempted workers covered by union agreements. Another factor is that Obama recently announced plans to introduce a bill to increase the federal minimum wage. I think it’s hard to believe it coincidental that SEIU, one of the largest contributors to Obama’s 2012 reelection, unfolded the campaign just in time to deliver the legislative effort a ready-made support base. Some have called FFF a form of “venture syndicalism”, a tactic whereby unions fund riskier and more confrontational start-up efforts. In terms of tactics this makes sense but I think only at the surface level, as I think it is questionable, unlikely even, that SEIU is committed to building anything beyond a campaign for legislation or national level agreements that are made over the heads of workers. Others have cast the effort in the light of “militant reformism”, whereby reform oriented and institutional actors temporarily adopt militant tactics associated with more radical movements but only with the goal restoring their seat at the table. I think this is basically correct when looking at the use of one day strikes by mainstream unions such as SEIU- this is a change in tactics but the model of top down unionism tied to the Democratic Party remains firm. The best framing in my mind though is “militant lobbying,” where seemingly militant tactics are used not with the goals of empowerment and building a militant movement but creating a new base, guided from above, to push for legislation. So how should we relate to the campaign and called for August 29 strike? Undeniably the campaign has lit a spark and is bringing together in meetings, rallies and strikes workers who would normally not be in the same room together. I would say support the strike action, go on strike and organize your co-workers if you work in fast food and most importantly make contact with striking workers. We should not do this though without any illusions of where this is headed and our focus should be the need to build an inside/outside yet independent effort of fast food workers. Workers are brought into the campaign with little training on organizing, shop floor issues remain unaddressed and these are places where radicals can step in to play a practical role. Instead of lobbying the same entrenched political system, appealing to change from above, and attempting to retool the existing system of profit, inequality and exploitation, it’s time for the left to build its own organizing efforts and worker organizations that are committed to a long term vision of building a new world where our lives are not controlled by and dependent on bosses, corporations and politicians. The Fight for Fifteen campaign presents the potential to take an important step in that direction. Speaking to workers involved in the campaign in several cities on the condition of anonymity I was told stories of how when important shifts in the public direction of the campaign were made they were instructed to state publicly “the workers made this decision." There's a double negative here that produces a meaning contrary to what Adam is intending. The method is pure pre-war syndicalism. Everything the author says could be taken from any Industrial Workers of the World (IWW) propaganda piece about any American Federation of Labor (AFL) union from before the war. I don't understand the tendency to critique the IWW as a 'red union'. A red union would be something like PAME in greece, built largely for stalinists and to breed support and leverage for the Greek CP. I don't see what your problem is here, and why you don't consider the IWW to be a 'red' union. I think that it has generally been considered to be one, and was involved in the setting up of the Red Trade Union International, the Profintern after the Russian revolution. FWIW, post # 99 are some comments which I wrote which came off the heels of this piece. Mainly comments between some comrades concerning the recent fast food stuff.
. I think that it [the IWW] has generally been considered to be one, and was involved in the setting up of the Red Trade Union International, the Profintern after the Russian revolution. Was it? I know the IWW ultimately rejected joining the RTUI, were they involved in setting it up? They were there. There was an official delegate from the IWW, Williams,at the foundation congress of the Profintern in July 1921. Perhaps 'involved in setting it up' is too strong, but they did send a delegate. Officers followed organizers home after meetings, ordered workers not to sign petitions and blacklisted organizers from city hall, according to the suit. They claimed to have been authorized by McDonald’s, the world’s largest fast food chain, and in one incident a McDonald’s franchisee joined police in tailing protesters.